Wedding season is approaching quickly – this means that you need some help in deciding what you should be your style. 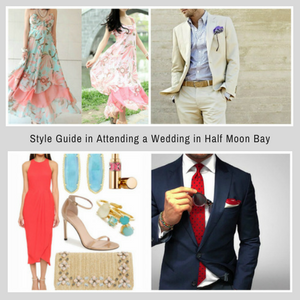 You might have already attended a spring wedding these past months or an early fall celebrations in Half Moon Bay. Well as a guest, you should know the couple preferences in what they expect from their guest if the invitations are descriptive. If not, it is essential to have a good interpretation. Every wedding is totally different. Here are a few outfit inspirations that will keep you celebrate in style. Hers: Summer sundress or a skirt or pants with a nice blouse; everyday, natural makeup and hair. His: Dress pants with a button-down shirt or polo. Hers: Formal (tea or knee length) summer sundress with flat sandals, natural, everyday make up and hair. Hers: Long dress, dressy suit or formal cocktail-length dress in a dark, neutral color (brown or black). His: Tuxedo or a formal dark suit and tie. Hers: Full length ball gown in a neutral color (brown or black), glamorous make up and dramatic jewelry and hair appropriate. His: Tuxedo, long black jacket with tails, a white pique vest, bow tie, formal shoes and optional white gloves dancing.